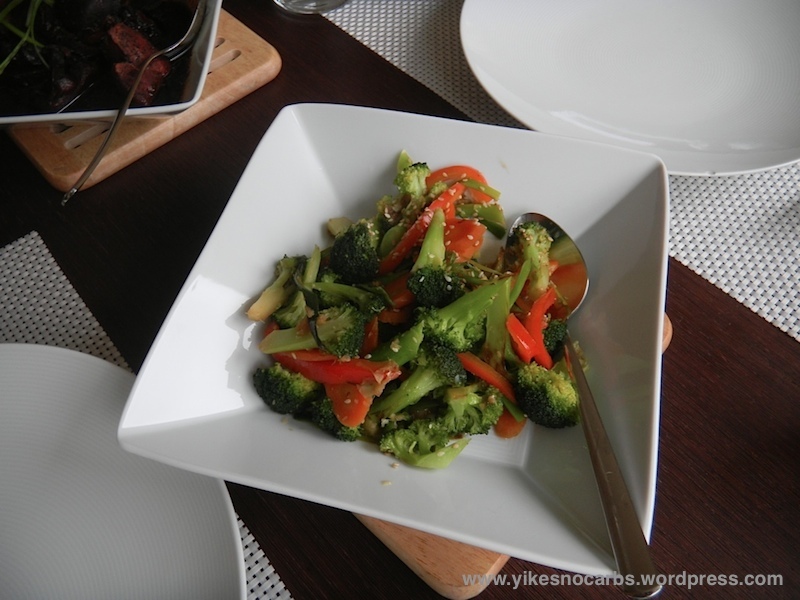 Accompaniments | Yikes! No Carbs Please! Spaetzle means little sparrow in German but no, these are not little sparrows to be eaten, thank goodness! 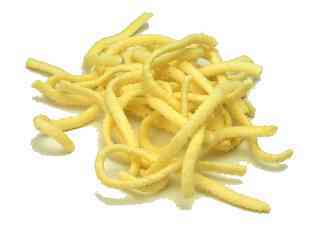 Spaetzle is the name given to a kind of homemade noodle which the southern Germans serve as an accompaniment to their meat dishes and with gravy. The noodle can also be served as a main course. In this case, it is topped with melted cheese and roasted onions and is called Käsespätzle (cheese spaetzle) or when there is leftover spaetzle from a previous meal, the leftovers are stir-fried with some meat, veggies and egg or whatever is left in the pantry. This little noodle has crossed borders and is also served as an accompaniment in Austria, Switzerland, Hungary, in the Alsace region of France which borders Germany and in the northern part of Italy which borders Austria. When I came to Germany, I fell in love with spaetzle, bought myself a spaetzle press and re-created these at home. There is absolutely no comparison between homemade spaetzle and the dried packaged version. Just doesn’t taste the same. If I had a choice between having spaetzle or potatoes with my meal, I would invariably choose Spaetzle. …or in little knobs or buttons. In the latter case, they are called Knoepfle which means little buttons. I have both types of presses but have had more success using the ‘button’ press. Like all pasta and other types of noodles, the main ingredient is some kind of flour, whether it be wheat, spelt, buckwheat, rice or durum wheat, all of which spell out loud – CARBS! If you’ve been following my blog, you’ll know that I discovered Shirataki noodles some time ago. I ordered a huge box containing 30 packets and am by now a bit Shirataki-ed out. So when I found this recipe which said Low Carb Spaetzle here in German and found I possessed all the ingredients to make it, I immediately printed out the recipe and whipped this up. There was no nutritional information given. Only after I made the spaetzle did I realize that it couldn’t be so low-carb when the recipe called for 200gr of chickpea flour. I put the ingredient list through the nutritional calculator on Spark Nutrition which I use frequently and to my dismay, saw that one portion contained 19.9gr carbs! So really, this recipe has no place here on my blog. I then checked out the nutritional information for my normal spaetzle recipe and one portion has 49.2gr carbs. 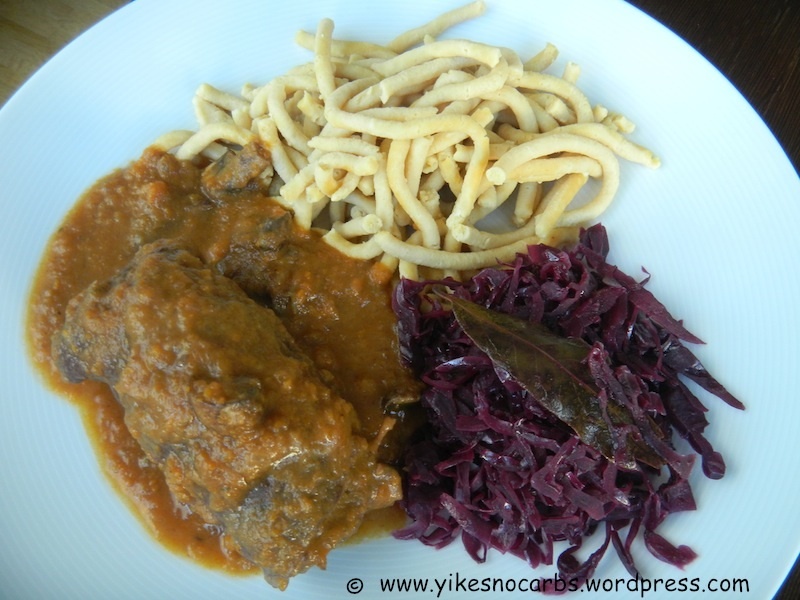 But … I am still going to post this recipe because it turned out really well, tasted good and well, once in a while you’ve got to give yourself a treat,so why not a treat which already has less than half the carbs in a normal spaetzle portion? Besides, I tried a spaetzle recipe using soy flour and it was a flop – so it’s back to this spaetzle recipe for me. This recipe is a translation taken from the forum linked above. The author says the recipe makes enough for 3-4 persons when served as an accompaniment but for my family, it looked like it could serve 5-6. I’ve calculated nutritional information based on 6 servings. I’ve also just noticed that the liquid used is milk but I didn’t see that and used water instead, so you can try both. For this recipe you will need a spaetzle press. It is also possible to make spaetzle without a press but it seems a laborious job to me and is probably for those who know how. 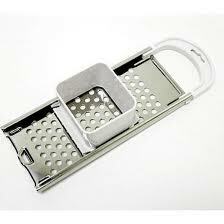 I used a spaeztle press which looks like this. I think I read somewhere on the German forum that it didn’t work so well with the other type of press. Bring a large pot of water to boil. Add some olive oil and salt to the water. Now start preparing your batter. Mix everything in a mixing bowl with a wooden spoon. You should get a relatively thick, sticky, gluey dough which adheres to your wooden spoon. When your water is boiling, put the spaetzle maker over the pot and working quickly, put in as much of the dough as you can into the container. Start pushing the container back and forth over the sieve and the batter will drop into the water in little drops. They will rise to the surface when cooked. This happens really quickly. If your pot is not big enough or if you can’t work quickly enough, stop and scoop out the cooked spaetzle before proceeding with the rest of the batter. I find this batter much easier to work with than the normal spaetzle batter containing flour. And voila, one part of dinner is ready. Total cal – 229.8 kcal; Fat – 9.1 gr; Carbohydrates – 19.9 gr; Protein – 16.3 gr. Total cal – 279.3 kcal; Fat – 4.3 gr; Carbohydrates – 49.2 gr; Protein – 11 gr. Update 25/09/2011 – I just made Spaetzle today and instead of using 200 gr chickpea flour, I used 150gr chickpea flour and 50gr soy flour. It worked and tasted so good with my Hungarian Gulasch. If the whole recipe serves 6, then it works out to 13.9gr net carbs and if it serves 4, then its 20.8 gr net carbs. Next time, I’ll try 100 gr chickpea flour and 100 gr soy flour. Note: the alteration above does not appear on the link below so make the adjustment if you wish to use soy flour. Here is an attempt to make cauliflower rice more interesting! Heat the olive oil in a wok or large pan with a lid. Add the tomatoes, bell pepper and saffron and sautee a little, then cover and leave on medium low fire till the bell pepper is cooked and tomatoes mushy, about 5-10 minutes. Pile the riced cauliflower on top (don’t stir in). Put the lid on and leave for 5 minutes. When done, take off the lid and stir to mix. Finished! Note: you could cut down on the calories and fat content by omitting the olive oil. Instead saute the tomatoes and bell pepper in 1 -2 Tbsp water! Calories are reduced to 58 kcal per serving and fat to 0.6 gr! Cauliflower rice is sooo good and I can’t get enough of it. I mentioned in one of my earlier posts that I am a ‘rice’ person. I love rice. Today, I decided to experiment further with cauliflower rice and decided I would try making coconut cauliflower rice. I added 10 gr of dessicated coconut to the rice to flavour it. I’ve noticed that cauliflower rice does not absorb flavours too well so probably 20 gr would have been better. The recipe below is calculated on 20gr dessicated coconut. To accompany the rice (not the other way around 🙂 ), I chose to make broiled salmon and serve it with spinach and mushrooms in a curry cream sauce. The whole meal has 11.2 g carbohydrates! Sprinkle salmon with salt and chilli flakes. Place on baking sheet or in a pan. Drizzle with 1 tsp oil or better, olive oil. Turn on your broiler and broil the salmon for about 10 min or till done, flipping once. You can test for doneness with a fork. If the fish flakes, it’s done. Season the spinach with salt to taste, add the cream and curry powder and mix well. If the cream is quite thick, thin with a little milk. Place the riced cauliflower, coconut and optional sultanas in a microwave dish. Sprinkle with salt. Mix well and microwave on high for about 3-4 minutes (depending on how powerful your microwave is). Optional – Garnish with fresh coriander when serving. Yesterday, I decided to give the cauliflower rice recipe a go. 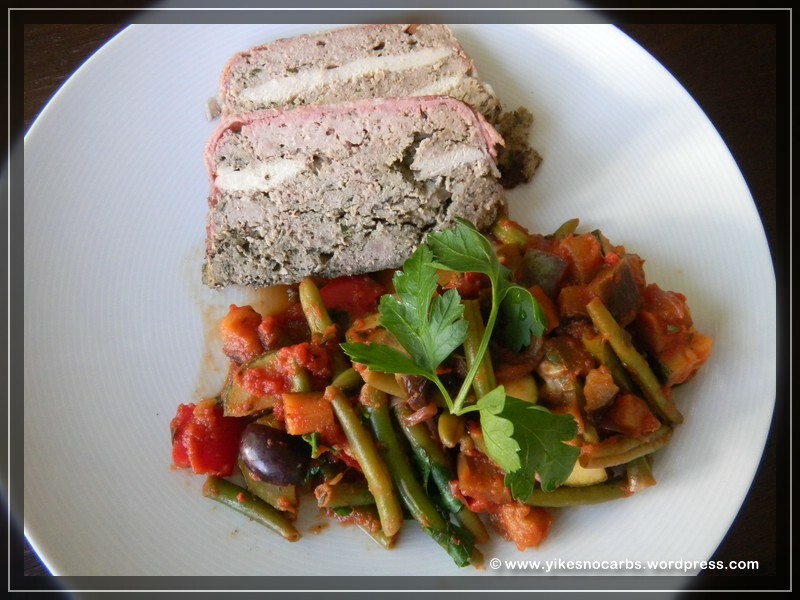 You can find this recipe in every low carb website and blog. I got mine here but do read on to see how I handled it. Since I was big on carbs before going low carb, I thought it would be nice if some things could be replicated – well, as best as can be replicated. So I was thrilled to see that you could use cauliflower to make rice. Actually, I am not a cauliflower fan but a rice fan and if everyone is raving about this, then it is worth a try. I bought my cauliflower – a regular sized one. I forgot to look at the label to see how much it weighed so that I could do my calculations. Update: I have done my weighing and calculations. I would estimate anywhere between 100-150gr cauliflower per person, depending on how big a portion you can eat and how many carbs you are allowing yourself to have. 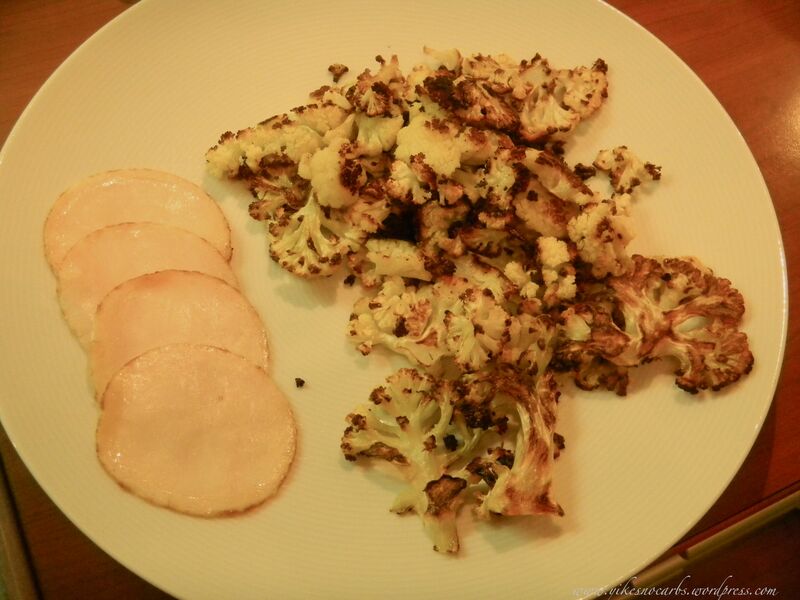 100gr raw cauliflower has 5.2 gr total carbohydrates and 2.7 gr effective carbohydrates. So, I peeled off the leaves, cut off the stem and then the cauliflower into chunks, washed the pieces and was now ready to rice the cauliflower. How should I do this – using the food processor or a grater? I noticed while cutting the cauliflower into pieces that it messed up the work table a little, so I could imagine if I used a grater, I would have little bits of cauliflower flying all over the place. Conclusion, use the food processor straight away. Well, the first thing the recipe does not tell you is that a regular head of cauliflower cannot be processed all in one go in a 1.5 litre capacity food processor. You would be better off doing it in two batches. Ok, so I poured everything out and did it in two batches. It was quite easy. Just use the pulse button. That was a good decision – to use the food processor. The second thing the recipe does not tell you is that a regular head of cauliflower yields alot of rice – a mountain of rice. I had fish and stir-fried vegetables last night and only required ‘rice’ as an accompaniment. I estimated I would need about 4 tablespoons. I probably had enough riced cauliflower to feed 10 people. I intended to make mock fried rice the next day, so no problem. Cooking 4 tablespoons of riced cauliflower sounds pathetic but when you think about the way it is done, this is so practical. You wouldn’t be able to cook 4 tablespoons of white (or any kind of ‘real’ rice) but you can cook as many tablespoons of riced cauliflower as you want in the microwave. So I put about 4 tablespoons in a microwaveable dish and zapped it on high. Instead of cooking it for 4 minutes as stated in the recipe, I needed only 2 1/2 minutes for the little quantity I was making. The ‘rice’ was lovely and I hardly noticed that it was not real rice when eating! Now, you must be thinking, why didn’t I just cook the rest of the riced cauliflower. In real fried rice, you cook the rice the day before, leave it in the fridge and then make your fried rice the next day. The recipe I found for mock fried rice called for cooking the cauliflower together with the other ingredients not like real fried rice. Since I wanted to cook fried rice the next day, I decided I would keep the cauliflower in the fridge and cook it the next day. Unfortunately, I discovered ricing your cauliflower one day ahead is not a good thing. 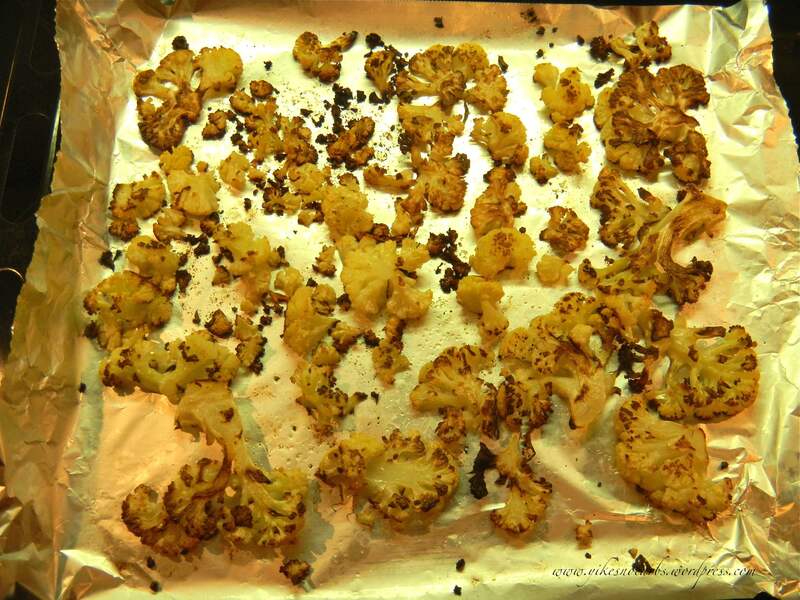 My cauliflower turned brown – was however, still ok to use. Today, I took my usual fried rice recipe and substituted the rice with riced cauliflower – actually I don’t have a recipe. I just add stuff from feel. Here it is! Sorry about the quality of the photo. Looks like the real thing. Tastes a little different but still surprisingly good. If you don’t know how to make fried rice at all, then google for a recipe and where it says rice, add the uncooked riced cauliflower. From that point, keep stir-frying till you think the cauliflower is cooked and then add the seasoning. Some people like it with a bite to it, others like it mushier – but don’t let it get too mushy. I would recommend scrambling the egg separately and mixing it into the cooked cauliflower rice. I found that the egg, when scrambled into the same pan as the cauliflower, tended to bind the cauliflower pieces together. Well, I’ve ended up with a lot more fried rice than I wanted so it looks like fried rice paradise for the next few days. When I make this next time, I’ll add a recipe to this blog.